The minumum stay on weekends is 2 nights (friday/saturday). Should a group booking be made for less than two nights at a weekend we will be forced to cancel your booking in this case. The hostel has the right to ask for a security deposit of 20â'¬ per guest on arrival. You will get the deposit back on departure, if no damages or cases of massive complaints about the behaviour of the group has been occured. Our philosophy is to offer you accommodation far away from home where you can nevertheless feel at home - and we mean this literally. We are not a branch of a hotel chain, so enjoy the relaxed and homely atmosphere with all the conveniences of a residential community. You can use the communal kitchen (0800: 22:00) or engage in conversation with other guests in the lounge or watch a film. There is free wifi in all areas. The beverage vending machine also offers cold beers. We do not have a bar, since we believe that the Altstadt and the Hafen area offer more than enough exciting entertainment and we want to provide a place where guests can catch their breath and relax. Only 15min. walking distance to the famous Altstadt! 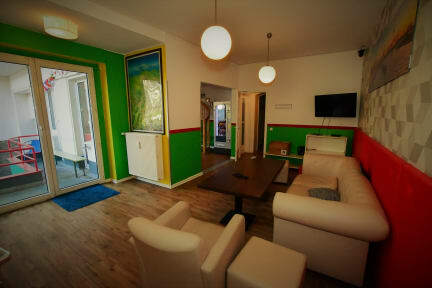 Backpackers in Duesseldorf is a comfy and neat place. The people running the hostel bring in a personal, friendly vibe which is reflected by the other guests. I found the bathrooms exceptionally clean. And of course, the breakfast is definitely a plus! Had a good stay at Backpackers. Would recommend to anyone. BYO linen or 3€ for sheets, towel is included though. Pretty good location, not much atmosphere though and breakfast was included so always a plus. Stocked kitchen facilities so can easily make own food and supermarkets very close by. Very nice set-up and the lounge areas are spacious. Wished the outdoor areas were open later in the night. Not sure what was happening but around 4:30am, someone was kicking and banging the main doors. This was going on for about an hour; presumably, someone forgot the PIN to enter the building after-hours. Nice enough place, although could use some actual bedlamps. Rooms and common area were clean enough, but bathroom could have been cleaner. Also there's only one bathroom for the entire floor, which really isn't much. One of the staff members, an middle aged non-German man, was really rude and unpleasant. Wouldn't stay again for that reason. The hostel is a very basic place. There was no atmosphere to it; we arrived as a group of four for two nights and didn’t come across anyone else (bar the typical stay in the kitchen playing PC games type). Rooms were also incredibly basic and showers left a lot to be desired (poor pressure and all open). Toilets could have been cleaned and only two toilets between 24 beds makes the mornings a rush. That said; free parking and breakfast offered a genuine saving.